I like to call this Rosemary Parmesan Chicken recipe a one-dish wonder. It all bakes together and it’s everything you need for a complete meal. It’s easy and family-friendly. If that’s not enough to convince you to try it, this should be the clincher. It’s delicious…the chicken is moist and the vegetables are crisp. The veggies are tossed in olive oil before they go in the oven. I used to do this in a bowl until I realized that I could toss them right in the baking pan. I like my veggies very done, so I bake them for a bit before the chicken is added to the pan. You’ll have plenty of time while the veggies are baking to put together the topping. My favorite thing to use for bread crumbs is left-over hamburger buns. It seems we never finish a bag of buns and there are always a couple laying in the cupboard. I throw the buns in my mini food processor and in no time the crumbs are ready. If you don’t want to make your own, any kind of packaged bread crumbs will work. 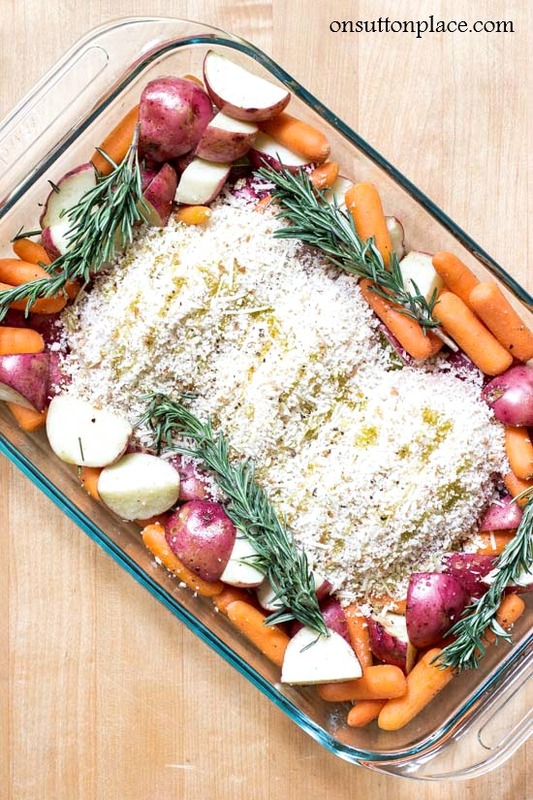 After the veggies have baked for a bit, remove them from the oven. Move them to the sides of the pan so you can put the pieces of chicken in the middle. 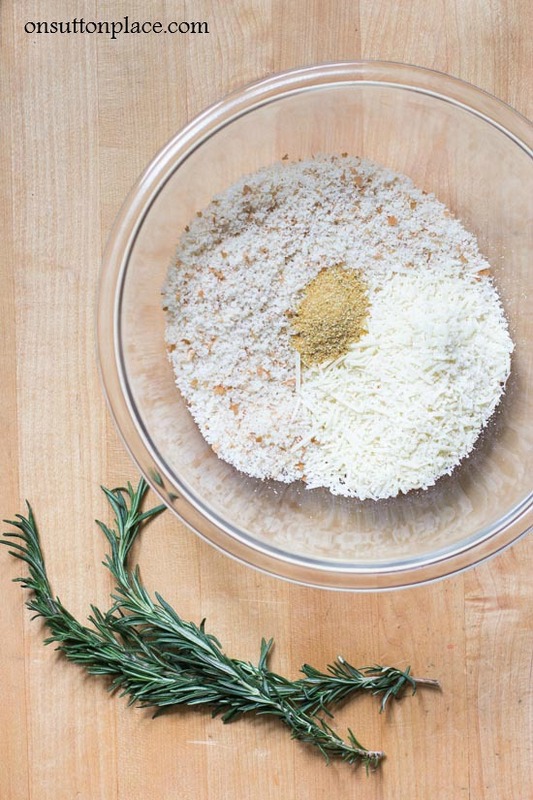 Add your topping and a few sprigs of fresh rosemary right before it goes back in the oven. This recipe can be doubled but you will have to use two pans. Just bake the chicken in one and the veggies in another. 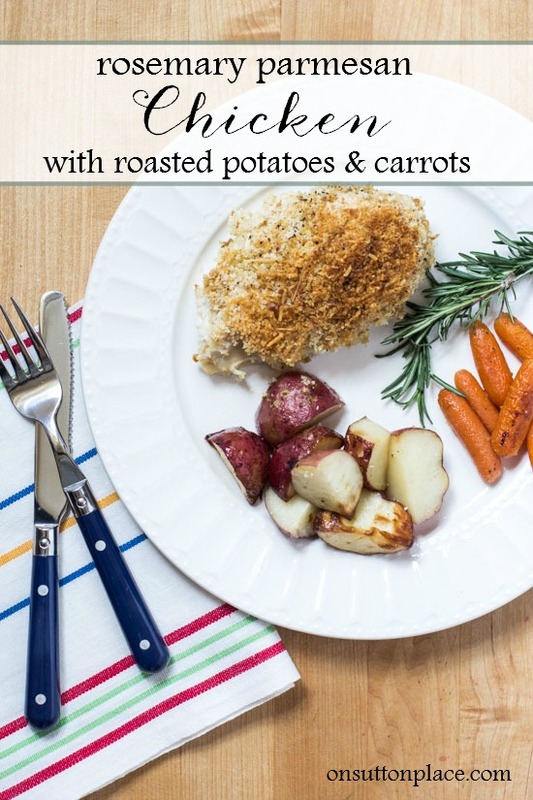 Rosemary Parmesan Chicken Recipe | An easy, family-friendly main dish that can be made all in one pan and in about an hour. 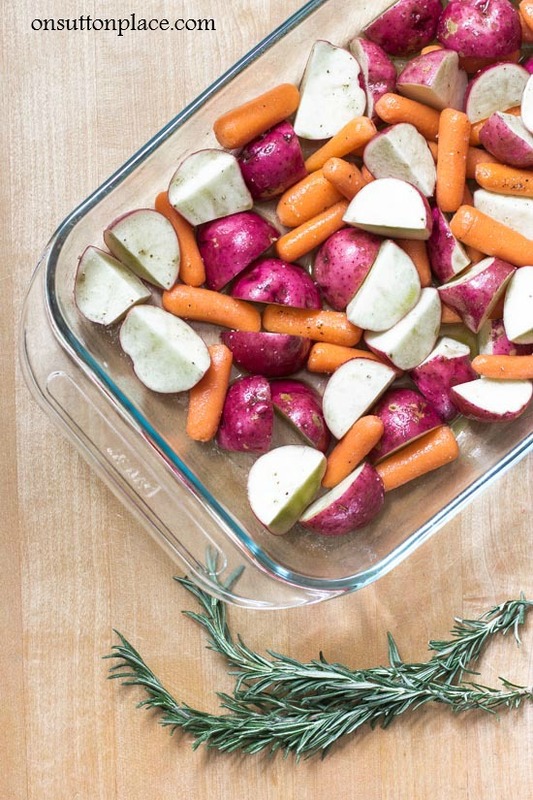 Toss potatoes and carrots with olive oil in the 9 x 13 baking pan. While potatoes and carrots are baking combine bread crumbs, parmesan cheese and garlic powder in a bowl and mix lightly with a fork. Remove pan from oven after 25 minutes. Place chicken breasts in the middle of the dish. Add salt and pepper. Drizzle with olive oil and lay Rosemary on top. Bake for 40 min. uncovered. If the chicken starts to brown too much cover loosely with foil. This rosemary parmesan chicken recipe does take a little prep but it’s not hard…and when it’s baking, the scent of rosemary mixed with garlic fills your kitchen. It’s comfort food that fills your body and your soul. I hope you try it! Click these links for more comfort food inspiration! The scent of rosemary is heavenly… takes any dish up a notch. Thanks Ann for taking us back to a simple dish made wow. I, for one, don’t like a dish with 20 ingredients. Sounds delicious and easy. Have you ever used fresh garlic though? I really enjoy all your recipes and decorating ideas. I love getting your emails. I made your Rosemary Parmesan Chicken tonight. My husband and I both thought it was delicious. Definitely a keeper, and will be a great meal to have for guests. Ann, just love your recipes! They are so delicious! Thanks! YUM! How easy is that. Will try it this week. Not too heavy but with hearty veggies. Love it! Going to try this tomorrow,thanks sounds delish. Hi Ann, Would you believe I’m making parmesan herb chicken with panko bread crumbs, Italian green beans and tossed salad. Your recipe sounds amazing and I will want to try it soon. I too love roasted vegetables in the oven and especially carrots they come out caramelized and so sweet. Have a wonderful Sunday and thank you for all your great recipes and ideas. I’m so glad I found you! Ann, thank you for sharing. I am adding to this weeks recipes. I know we will love it. And so simple too! Have a wonderful week. This looks like a dish I can make! And, my family will eat. Thanks Ann! I just had a piece of English muffin bread and a fried egg for breakfast and I’ll be making Rosemary Parmagina Chicken for dinner. Thanks for feeding me Ann!!!! Have a great Sunday! I love one-dish meals! If I were to double it, I’d want to make two identical pans so the veggies would have the added flavor of cooking with the chicken! Love the ease of using baby carrots, too! Less prep, more time for other endeavors! This all in one supper sounds yummy! It just got put on my dinner menu for tonight. 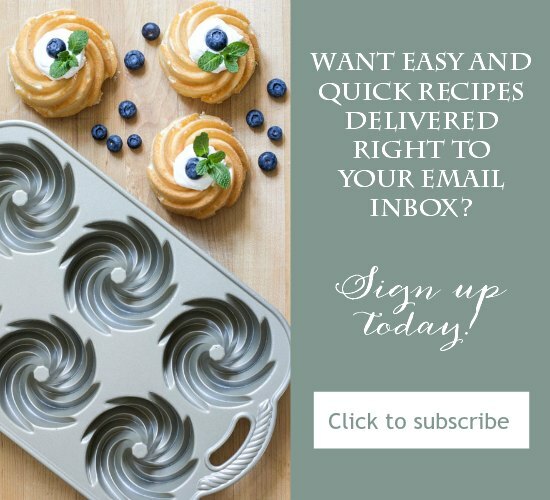 Thanks for sharing all of your recipes! The ones I’ve tried are delicious! Love your heartfelt blog Ann! Ann, I appreciate your style and adore your recipes! I’ve tried several – thank you. Thanks Ann. We have family Sunday dinner after church at our home. Because my son and his family are so busy we all know we will he together for Sunday dinner each week. This has become a tradition in our home. No one plans anything on Sunday. This recipe will be perfect for me yo do. I try to he creative each week. I can put this in before church and it will be perfect. Thanks as always. Thanks for an idea for Sunday lunch! I will try this today! Fixed this great recipe! My husband loved it! Used butternut squash, zucchini, and broccoli for the veggies!